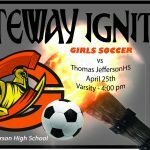 The Lady Olys will jump on I-225 and roll over to Thomas Jefferson HS today for a make-up match. Kick-off is scheduled for 4:00 pm. Go make it happen Ladies!! The 2018 Lady Olys Varsity Soccer team will host cross-town rivals Hinkley HS today. The match has a new start time. Kick-off scheduled for 4:00pm this afternoon.